However, HTC does not have a global career website. Each region or country has its own respective recruitment portal. These individual career website designs are fairly dated and inconsistent, and do not reflect HTC’s new brand image. On top of that, most people only know HTC as a brand that produces smartphones – not a company with a great working culture and benefits. HTC needs a consistent, impressive and compelling global career website to attract more talent from around the world. It should reflect HTC’s new brand vision, help prospective candidates understand the company culture, highlight the benefits of working there, and the current career opportunities available. That’s why HTC came to Maximum for help. In addition to the new tagline, HTC’s new brand story is built on three pillars: Human, Transition and Connections. We took these pillars to structure the website. For example, “Human” reflects the people and culture at HTC. “Transition” captures the growth and development opportunities. “Connections” is the point where interaction begins. We came up with two concept designs. For the first one, HTC is the storyteller telling the audience its brand story through poetic body copy, elegant visuals and beautiful typography. For the second concept, which was preferred by HTC, we took a more practical approach. It was simple and clean with an easy-to-access architecture for a more enjoyable browsing experience. In order to make the browsing experience memorable and as real as possible, we sent our team to the HTC Headquarters in Taipei for a full day photo and video shoot of the employees and the building interior. These give the prospective candidates more of what they can expect from working at HTC. To add a more personal touch, we interviewed HTC employees and interns from different job functions to hear their honest point of views about HTC. 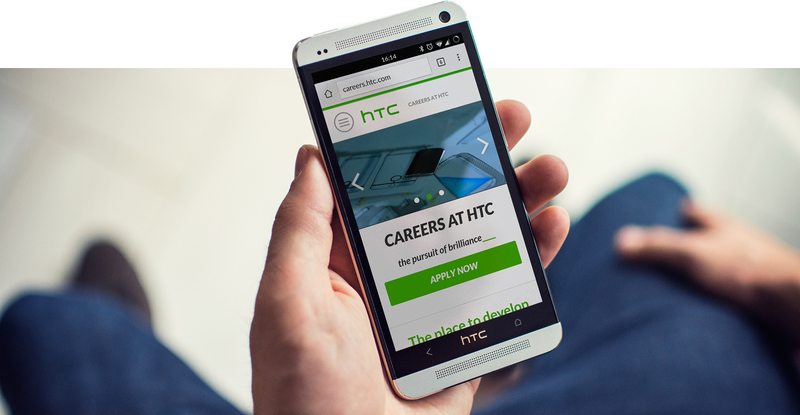 HTC’s global careers site was built in 5 weeks using HTML5 and CSS3 for the front end, and PHP for the back-end with a Model-View-Controller (MVC) framework. This keeps everything clean and makes the site easy to maintain and update. Our digital team made use of a versioning tool called “git” to easily roll out changes or additional features. A Google maps solution was implemented to provide applicants with an easy way to find HTC’s office locations. For users accessing the website within China, a Bing maps will load instead, as nearly all Google services have been blocked in Mainland China.